In 1905, an Andalucían sheep farmer called José Bullón Lobato noticed a swarm of bats flying around a mountainside. Since bat droppings are good fertilizers, he climbed up locate the source, hoping to use the droppings for his olive trees. He found an opening in the mountain with a deep chasm. 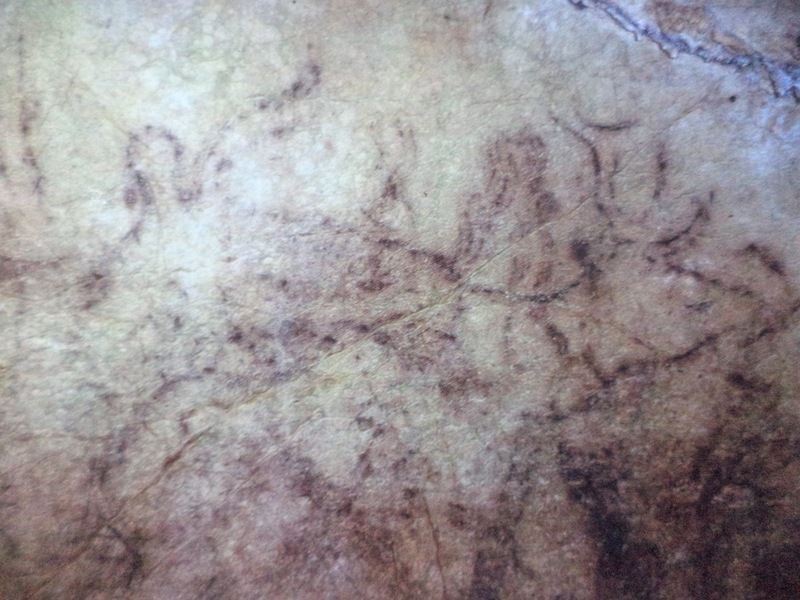 Returning with rope and a torch, he let himself down to discover an enormous cave with mysterious markings on the walls. He guessed that these were the work of the Moors, some 800 years back. He was off by over 20.000 years! He informed us of the strict rules to minimize the impact of visitors in this sensitive environment. No loud sounds, no touching walls or geological formations, and no cameras or videos, all of which can deteriorate the cave paintings and stone formations that have taken millennia to form. Electric light, he told us, bleaches the natural mineral deposits that give the amazing variety of colours to the cave walls. 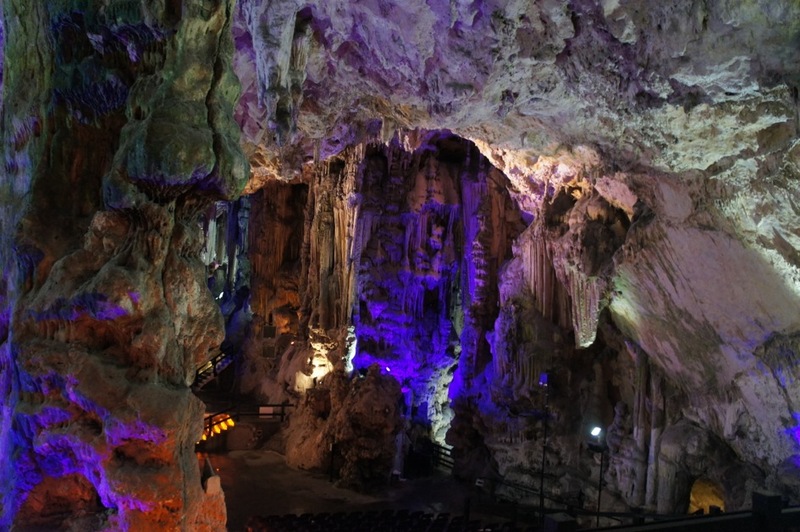 (In the floodlit theme-park-style caves of Gibraltar or Nerja near the coast, one can see examples of this deterioration) As we accustomed ourselves to moving in semi-darkness, an amazing underground world lay before us. La Pileta is truly a living cave. We heard trickles of water everywhere. And the flurry of bat wings. The cave is the home to 4000 bats, though not the Dracula blood sucking type, we were assured. Besides, at the time of our visit most of them were at work, catching other tasty morsels. In the first ‘gallery’, a natural chimney was used as an enormous hearth during the Bronze Age. 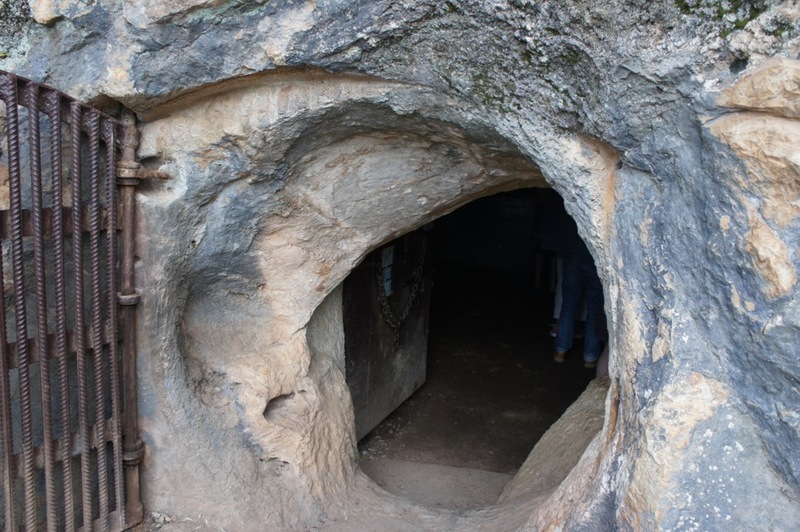 Further into the cave we would see soot deposits from smaller fires, as there was natural ventilation there. Moving along the slippery ground, I felt as if we were walking on a petrified composite of human remains. And we probably were. 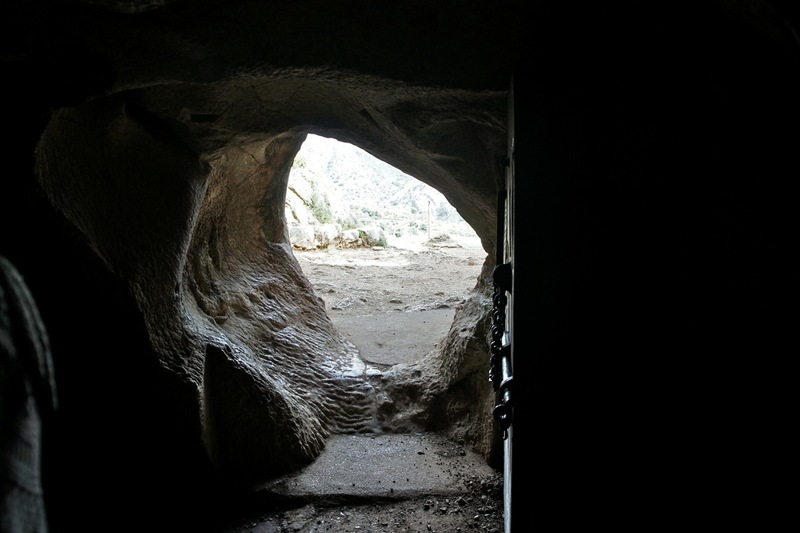 Both Paleolithic and Neolithic Man occupied this cave for long periods of time. Fragments of pottery have been found, as well as several skeletons. Amongst these was a stout and muscular man of the early Neolithic European race. La Pileta was thus one of the places where the first Homo sapiens sapiens made their home after crossing over from Africa. Not only did the cave dwellers live there. 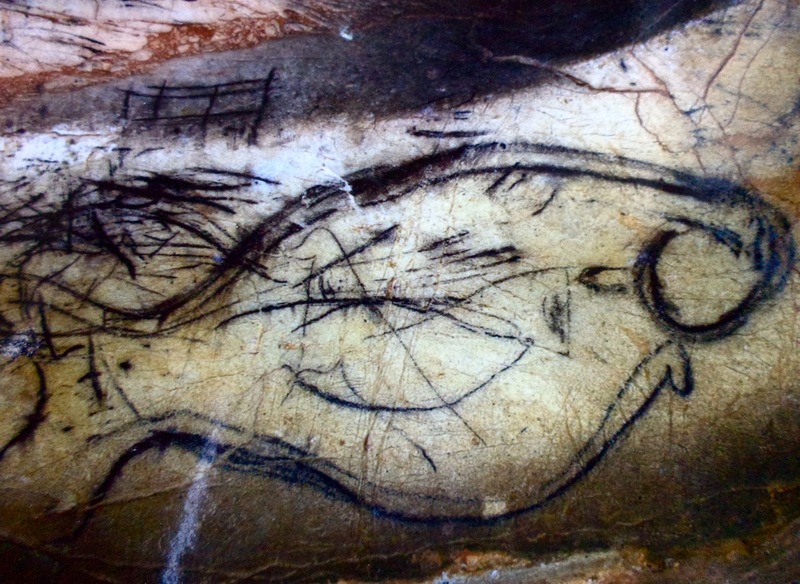 Our prehistoric relatives also made amazing art from clay, minerals and animal fat. 134 paintings, black, ochre and red, have been found, some five times older than the Egyptian pyramids and many quite inaccessible. How did our ancestors manage this? that found in southwestern France and northern Spain. Does this mean that there were traveling art teachers back then? Up close we could see tiny droplets carrying microbes of limestone attaching themselves to the bottom of stalactites, eventually falling and forming a stalagmite below. 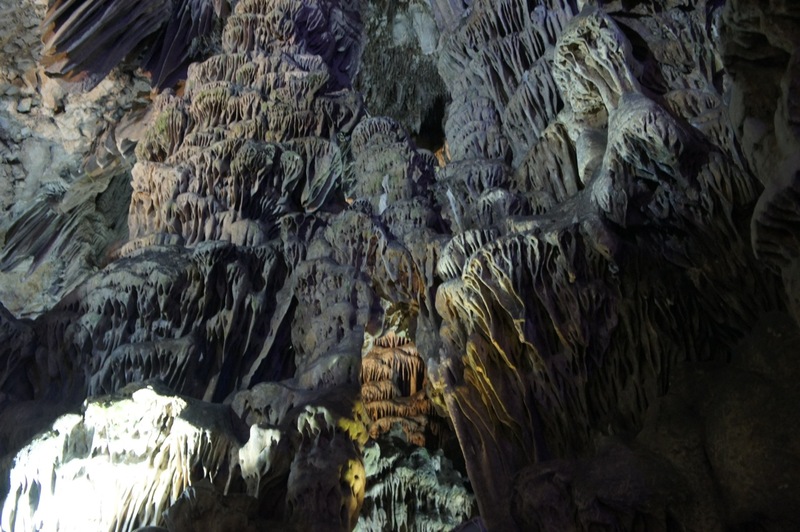 It takes about a thousand years for a stalagmite to grow a single millimeter – that is unless the drop comes down too quickly, eroding instead of adding to it. We were told the names of some of the rock formations, but I was too busy trying to stay on my feet and lighting the way for an almost legally blind co-visitor to take much note. We had hardly walked a fraction of the explored caves, only what now is accessible and considered safe – not safe for the general public of course, but safe for the cave paintings and geological formations. Back outside, after buying a couple of post cards by candle light, I could honestly say that it had been thrilling and that this would not be my last cave. It was a true privilege to be taken on a journey of 30.000 years of prehistoric art, even more so when it was guided by a family-member of the man who re-discovered the cave a century ago. Congratulations on a beautifully written article about one of the areas true gems!